Massive increases to education funding are going to occur, from $17.5 billion today to $30.6 billion in ten years time. The excuse? Preventing children from “falling behind”. But is this claim backed by evidence? Gonski 2.0 is a socialist education funding model promoted by the Turnbull government. The Government’s own documents explicitly states that “students with greater needs will attract higher levels of funding”. This is reminiscent of Karl Marx slogan “From each according to his ability, to each according to his need”. Now for the case of this article I will focus not on “special-needs” or disabled schools as I believe this is a separate moral case. I will rather focus on regular public schools. Schools that are farthest furthest behind will receive the most funding. Gonski’s funding model is based off several formula (see Schooling Resource Standard), but essentially schools that (a) are small, (b) have many students with low socioeconomic backgrounds and (c) have many indigenous students will receive greater funding. These factors massively influences funding outcomes. Side-by-side comparison of year 3 and year 9 NAPLAN reading rates across Perth. Does intelligence create wealth or does wealth create intelligence? This is a fundamental question which is sure to raise a few eyebrows. We all have the innate understanding of the potential of man; that each individual can according to their own efforts rise or fall in the societal hierarchy. A concept I still broadly agree with. However, the data is something which both sides of politics would rather dare not bring up. If the left side of politics talks about it, they hinder their argument. If the right talks about it, they appear as elitist eugenicists. I managed to get my hands on the MySchools dataset containing all public, private and special needs schools in Australia. I can understand why they wouldn’t want it getting out of the researcher’s hands. Firstly, I stripped the special needs schools from all further analysis and secondly divided them into public and private. After plotting the data from the initial investigation, it appears that increased expenditure on schools does not improve outcomes. In fact, previous policies such as Gonski 1.0 has meant that schools with poorer outcomes receive more dollars per student, leading to the skewed plot downwards (i.e., more money, worse outcome). I could show all grades (year 3, 5, 7 and 9) and all metrics (i.e., reading, grammar, numeracy etc…) but the results looks the same. Injected money does not correlate with improved scores. So what is the main factor causing the large variations? To answer this, let’s look at it locally in Perth on a suburb by suburb basis. Taking the mean score per suburb and plotting it against the ICSEA socioeconomic index we find a trend which we all as Sand-gropers innately understand. 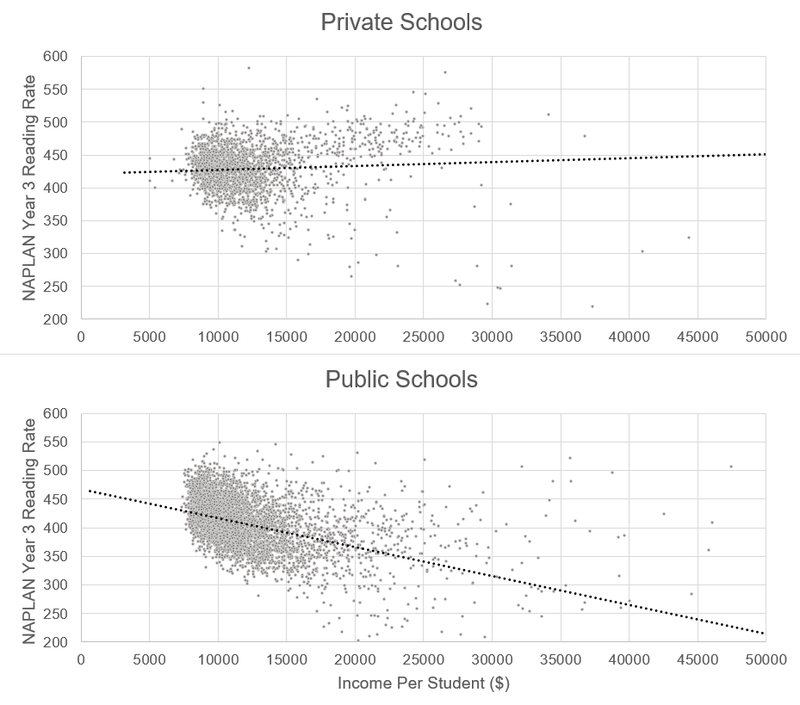 That ‘richer’ suburbs have better education outcomes. 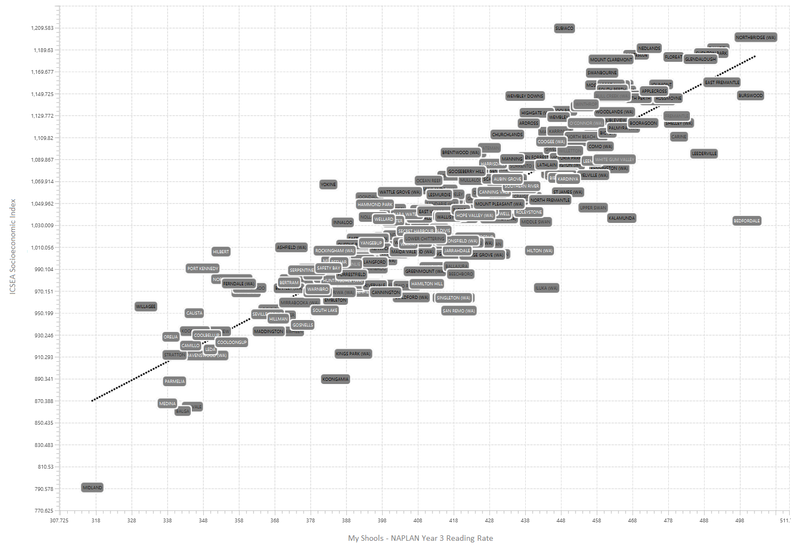 Perth suburb by suburb comparison of the median NAPLAN Year 3 reading score with the ICSEA socioeconomic index. So does a “needs based” education system make any difference, or is this just ingrained into the societal fabric? To drive this point home, let’s make a comparison between Balga Primary School and Dalkeith Primary school, both government public schools. Despite Balga receiving more money per student and having more teachers per students it is under-performing by a long margin. The Government’s explanation to apparent ‘needs based’ funding seems tenuous. Splashing cash is no solution to Australia slipping down the world’s rankings. Perhaps they are looking at the wrong end of town. They are thinking from the top-down rather than the bottom-up. From what I can tell most conservatives know that our children’s outcomes are highly dependent on the parents. Involved parents invest time and effort (not necessarily money) into their children. They read to them, teach them and give them a solid foundation. Parents holding an external locus of control don’t invest in their kids and believe that education and moral teaching is up to the schools. They complain when their expectations are not meet and demand more funding. In the Dalkeith and Balga comparison I would even speculate that if you were to put down parental input scores you would find that Dalkeith would be on top. So is the money worth it, probably not. But I don’t have enough data in-front of me to predict an overall outcome (i.e., foretasted net-tax paid per dollar invested [not an easy calculation], welfare payments, prison statistics etc..). To be honest, even after my analysis of NAPLAN results my decision making has been unaltered. I live down the road from one of the best public schools in the country (think top 2%). What may be shocking is that even I won’t send my kids there. Instead, my wife and I are making a choice (and sacrifice) to home-school our children. As our rationale we have observed the market participation rate shrinking at an alarming rate due to AI and automation taking over. The jobs of the future are going to be two-tiered, (1) the developers: the smartest of the group will make the technology to replace the rest and (2) the leaders: the most socially intelligent people will manage group number 1. Getting into either group takes more than good schooling.